The DIV-10 container lane selector gently channels containers to either of two lanes on a table top or belt conveyor. 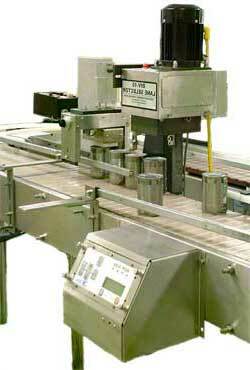 Operating at speeds up to 800 c.p.m., you can divide into an infinite number of lanes by cascading units. Various controller configurations are available to perform many functions from ejecting defective containers to separating inverted two piece or pull tab cans from correctly oriented cans. Please call to discuss your application.